Imagine for a second that a friend is talking with you through a plastic tube from across the room. You can hear him or her clearly, and vice versa, until someone steps on the tube and the communication is disrupted. This hypothetical situation is very much like a nerve condition we know as “peripheral neuropathy,” where you are the central nervous system, your friend is a foot, and the plastic tube is nerves that allow the two to communicate. Your central nervous system is comprised of the nerves from your brain and spinal cord, but it needs a way to communicate to the rest of your body. This is where your peripheral nervous system comes into play. You have an intricate system of nerves that connect to the rest of your body and deliver signals back to your brain regarding physical sensations experienced by feet, toes, and other body parts. In addition to those sensory nerves, there are motor nerves that connect to your muscles and control their movement, and autonomic nerves that regulate your internal organs. As you have surely experienced at some point, things can go wrong with how your body is supposed to function. Peripheral neuropathy is one of the many examples of this. When you have peripheral nerves that are compressed (pinched together by surrounding tissue), the nerves are not able to communicate with the central nervous system in their intended function. In addition to compression, this condition may be a result of damaged nerves, possibly from an accident, systemic illness, inherited disorder, or infection. When this happens, the nerves may fire randomly and send a message of pain when nothing is wrong, or vice versa. For those who have diabetes, it is important to recognize when an injury has occurred. Not knowing when you’re injured could lead to a situation where an infection can set. This situation leads to such symptoms as a gradual onset of numbness and tingling sensation, sharp pain, extreme sensitivity to touch, and muscle weakness. When the condition affects autonomic nerves, symptoms may entail changes in blood pressure, dizziness, heat intolerance, and digestive difficulties. Over half of the people who are living with diabetes will develop some form of neuropathy in their lifetime, so this nerve condition is of particular concern for them. The damage to nerve systems results from high blood sugar levels and risk levels increase for those with this disease who have high blood pressure, are overweight, or are older than 40. When you have pain due to an underlying nerve condition, an early diagnosis and treatment will allow you to find the relief you need and avoid the risk of permanent damage. Effective treatment options we use for this condition include laser treatment, anti-inflammatory medication, corticosteroids, physical therapy, orthotics, and surgery for when conservative methods do not improve your condition. In order to avoid having to deal with the pain and discomfort that comes with this nerve pain, your best course of action is to manage your diabetes or any other medical condition that puts you at risk in the first place. Even with a family history, you can prevent the onset of this nerve condition by engaging in healthy lifestyle choices and activities. A diet that is rich in whole grains, vegetables, fruits, and lean protein is a good idea anyhow, but it can be particularly helpful in keeping your nerves healthy. Exercise is also a staple for healthy living and, if your doctor approves it, try to incorporate three 30-minute workout sessions into your weekly schedule. 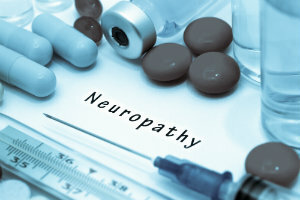 Smoking and excessive alcohol intake should be avoided, but especially if your goal is to avoid peripheral neuropathy. If you experience any of the symptoms mentioned here, contact our office as soon as possible for accurate diagnosis and quick, effective treatment. Call Harvey Danciger, DPM, at (760) 568-0108, or request an appointment at our Palm Desert, CA, office on our website!